Imbalanced classes put “accuracy” out of business. This is a surprisingly common problem in machine learning (specifically in classification), occurring in datasets with a disproportionate ratio of observations in each class. Standard accuracy no longer reliably measures performance, which makes model training much trickier. In this guide, we’ll explore 5 effective ways to handle imbalanced classes. Let’s say your client is a leading research hospital, and they’ve asked you to train a model for detecting a disease based on biological inputs collected from patients. But here’s the catch… the disease is relatively rare; it occurs in only 8% of patients who are screened. Well, guess what? Your “solution” would have 92% accuracy! Unfortunately, that accuracy is misleading. For patients who do not have the disease, you’d have 100% accuracy. For patients who do have the disease, you’d have 0% accuracy. Your overall accuracy would be high simply because most patients do not have the disease (not because your model is any good). This is clearly a problem because many machine learning algorithms are designed to maximize overall accuracy. The rest of this guide will illustrate different tactics for handling imbalanced classes. First, please note that we’re not going to split out a separate test set, tune hyperparameters, or implement cross-validation. In other words, we’re not necessarily going to follow best practices. Instead, this tutorial is focused purely on addressing imbalanced classes. In addition, not every technique below will work for every problem. However, 9 times out of 10, at least one of these techniques should do the trick. For this guide, we’ll use a synthetic dataset called Balance Scale Data, which you can download from the UCI Machine Learning Repository here. This dataset was originally generated to model psychological experiment results, but it’s useful for us because it’s a manageable size and has imbalanced classes. The dataset contains information about whether a scale is balanced or not, based on weights and distances of the two arms. 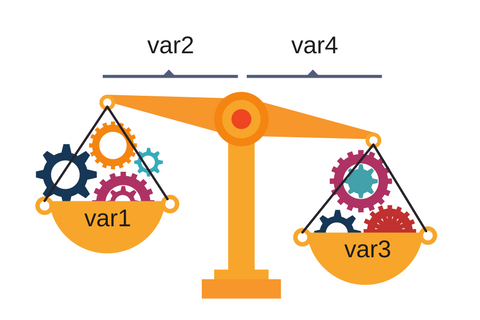 It has 1 target variable, which we've labeled balance . It has 4 input features, which we've labeled var1 through var4 . The target variable has 3 classes. However, for this tutorial, we're going to turn this into a binary classification problem. As you can see, only about 8% of the observations were balanced. Therefore, if we were to always predict 0, we'd achieve an accuracy of 92%. Now that we have a dataset, we can really show the dangers of imbalanced classes. First, let's import the Logistic Regression algorithm and the accuracy metric from Scikit-Learn. Next, we'll fit a very simple model using default settings for everything. As mentioned above, many machine learning algorithms are designed to maximize overall accuracy by default. So our model has 92% overall accuracy, but is it because it's predicting only 1 class? # Should we be excited? As you can see, this model is only predicting 0, which means it's completely ignoring the minority class in favor of the majority class. Next, we'll look at the first technique for handling imbalanced classes: up-sampling the minority class. Up-sampling is the process of randomly duplicating observations from the minority class in order to reinforce its signal. There are several heuristics for doing so, but the most common way is to simply resample with replacement. First, we'll separate observations from each class into different DataFrames. Next, we'll resample the minority class with replacement, setting the number of samples to match that of the majority class. Finally, we'll combine the up-sampled minority class DataFrame with the original majority class DataFrame. As you can see, the new DataFrame has more observations than the original, and the ratio of the two classes is now 1:1. # Is our model still predicting just one class? Great, now the model is no longer predicting just one class. While the accuracy also took a nosedive, it's now more meaningful as a performance metric. Down-sampling involves randomly removing observations from the majority class to prevent its signal from dominating the learning algorithm. The most common heuristic for doing so is resampling without replacement. Next, we'll resample the majority class without replacement, setting the number of samples to match that of the minority class. Finally, we'll combine the down-sampled majority class DataFrame with the original minority class DataFrame. This time, the new DataFrame has fewer observations than the original, and the ratio of the two classes is now 1:1. The model isn't predicting just one class, and the accuracy seems higher. We'd still want to validate the model on an unseen test dataset, but the results are more encouraging. So far, we've looked at two ways of addressing imbalanced classes by resampling the dataset. Next, we'll look at using other performance metrics for evaluating the models. Albert Einstein once said, "if you judge a fish on its ability to climb a tree, it will live its whole life believing that it is stupid." This quote really highlights the importance of choosing the right evaluation metric. For a general-purpose metric for classification, we recommend Area Under ROC Curve (AUROC). We won't dive into its details in this guide, but you can read more about it here. Intuitively, AUROC represents the likelihood of your model distinguishing observations from two classes. In other words, if you randomly select one observation from each class, what's the probability that your model will be able to "rank" them correctly? So how did this model (trained on the down-sampled dataset) do in terms of AUROC? Ok... and how does this compare to the original model trained on the imbalanced dataset? Remember, our original model trained on the imbalanced dataset had an accuracy of 92%, which is much higher than the 58% accuracy of the model trained on the down-sampled dataset. However, the latter model has an AUROC of 57%, which is higher than the 53% of the original model (but not by much). Note: if you got an AUROC of 0.47, it just means you need to invert the predictions because Scikit-Learn is misinterpreting the positive class. AUROC should be >= 0.5. The next tactic is to use penalized learning algorithms that increase the cost of classification mistakes on the minority class. During training, we can use the argument class_weight='balanced' to penalize mistakes on the minority class by an amount proportional to how under-represented it is. We also want to include the argument probability=True if we want to enable probability estimates for SVM algorithms. Again, our purpose here is only to illustrate this technique. To really determine which of these tactics works best for this problem, you'd want to evaluate the models on a hold-out test set. The final tactic we'll consider is using tree-based algorithms. Decision trees often perform well on imbalanced datasets because their hierarchical structure allows them to learn signals from both classes. Now, let's train a model using a Random Forest on the original imbalanced dataset. Wow! 97% accuracy and nearly 100% AUROC? Is this magic? A sleight of hand? Cheating? Too good to be true? Well, tree ensembles have become very popular because they perform extremely well on many real-world problems. We certainly recommend them wholeheartedly. While these results are encouraging, the model could be overfit, so you should still evaluate your model on an unseen test set before making the final decision. Note: your numbers may differ slightly due to the randomness in the algorithm. You can set a random seed for reproducible results. Creating synthetic samples is a close cousin of up-sampling, and some people might categorize them together. For example, the SMOTE algorithm is a method of resampling from the minority class while slightly perturbing feature values, thereby creating "new" samples. You can find an implementation of SMOTE in the imblearn library. Combining minority classes of your target variable may be appropriate for some multi-class problems. For example, let's say you wished to predict credit card fraud. In your dataset, each method of fraud may be labeled separately, but you might not care about distinguishing them. You could combine them all into a single 'Fraud' class and treat the problem as binary classification. Anomaly detection, a.k.a. outlier detection, is for detecting outliers and rare events. Instead of building a classification model, you'd have a "profile" of a normal observation. If a new observation strays too far from that "normal profile," it would be flagged as an anomaly. These tactics are subject to the No Free Lunch theorem, and you should try several of them and use the results from the test set to decide on the best solution for your problem.